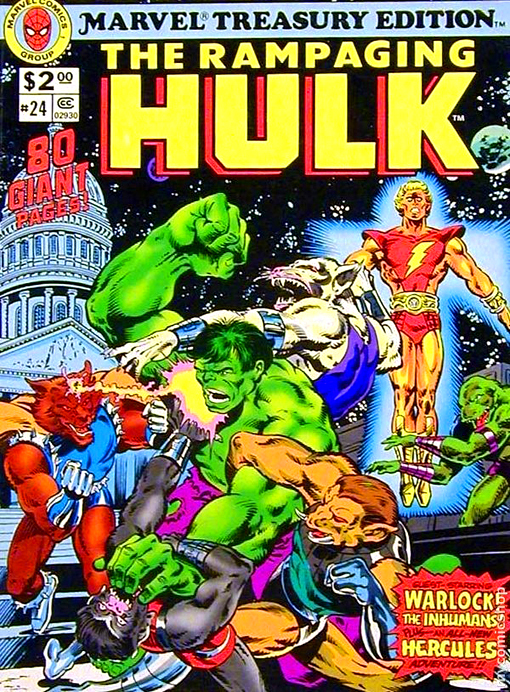 Synopsis: Marvel Treasury Edition #24 reprints Incredible Hulk #175-178 (May-August 1974) plus a 6-page Hercules solo story. The Hulk stories include Man-Brute in the Hidden Land!, Crisis on Counter Earth!, Peril of the Plural Planet!, and Triumph on Terra-Two! This over-sized edition features a fantastic new wraparound cover by Bob Budiansky and Bob Wiacek with Adam Warlock on the front and the Inhumans on the back.